Insulated Metal Panels are a rising trend in the construction industry for multiple reasons, but mainly for their versatility. ​Using these products offers multiple advantages, including superior continuous insulation, durability and ease of installation, and they allow architects to be creative in their design process. The panels come pre-assembled and are composed of two steel sheets poured with liquid foam that causes a chemical reaction and expands to form the foam core of these products. They can be installed either horizontally or vertically and are available in a variety of lengths and widths for all types of projects. Depending on the application, these products can be used for exterior envelopes or interior walls and ceilings. The steel used is either 22 or 26 gauge galvanized steel that comes pre-painted in a variety of colours, offering versatility and creative liberty to architects. The steel is available in different profiles, meaning that it is pressed by a roller to give it a certain visual effect and can also be embossed, which slightly increases its structural stability. This material has a high thermal value, acts as a vapor barrier and has structural performance features, which makes it an excellent choice for wall and ceiling applications. One type of panel is poured with polyisocyanurate foam (PIR), which has multiple benefits. Firstly, it increases the thermal resistance of the panel, which contributes to higher energy efficiency. The chemical reactions that make the foam expand have a low environmental impact and very few gas emissions. The foam increases resistance to moisture and fire, meeting the UL and FM testing standards, and has a long service life. The other type of panel has a mineral fiber core, a composite that is in increasing demand as it is known for its superior fire resistant properties. It is also used for its superior acoustics barrier, durability, thermal properties, as well as water resistance. Having these products pre-assembled in a factory ensures a controlled environment for product consistency. The joints are made to correspond to either a vertical or horizontal look. They are made by roll forming the steel right before the foam injection process takes place. One of the advantages of insulated metal panels, which has made them an increasingly popular choice, resides in the simple fact that they are installed in one easy step once they arrive at the construction site. Traditional constructions, however, can require up to eleven steps, which can lead to longer installation times and inconsistencies. This product is lightweight and requires less time and labour for installation. Overall, using insulated metal panels is not only more efficient in terms of cost and time, it also enables the architect to be as creative as needed for each project. These panels can be used as building envelopes in a variety of industries, such as food processing, cold storage, commercial, institutional and many more, and can be used as interior partitions for laboratories, clean rooms, etc. 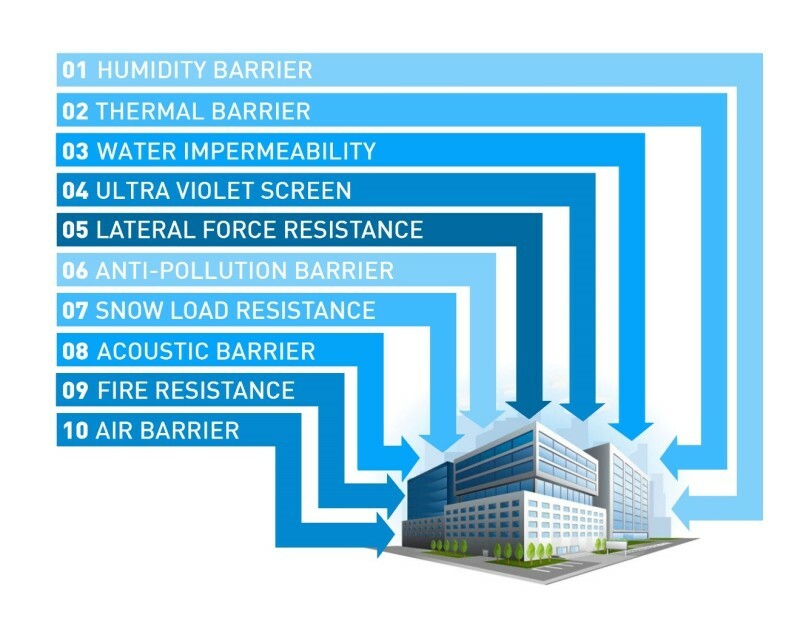 As the air inside of buildings has a higher density than that of outside, heat migrates towards the cold creating humidity in the structure of the building, in this case, the panels. Using insulated metal panels ensures that there is a barrier against humidity, as one of steel’s main characteristics is that it is a vapor barrier. To ensure that this barrier continues into the joints as well, a butyl sealant is applied in order to prevent the humidity from penetrating the insulating core of the panels. The steel’s characteristics combined with the butyl applied to the joints ensures a continuous vapor barrier throughout the panel walls. Compared to traditional insulated wall construction, polyisocyanurate has high R-values, a unit used to measure the thermal resistance of a composite. The foam has this property because of its composition, which includes thermosetting foamed plastic and a blowing agent. Together, they create a stronger thermal barrier than some foams that use only air. This is one of the many reasons why it prevents hot air from escaping and cold air from penetrating. Another reason is, due to their strong structural integrity, panels need fewer screws that are further apart, allowing for less air flow, whereas traditional walls need screws every few inches in order to secure the materials to the structure. With this procedure and the added bead of butyl, the insulation factor is increased throughout the entire wall. Also, steel surfaces are protecting PIR from air and sun exposure for a long term performance solution. The joints used when manufacturing the insulated metal panels are designed to create a curtain wall against water infiltration once they are installed. The first layer of protection is the factory applied bead of butyl. In the unlikely event that water does infiltrate, it cannot get beyond the equalization compartment in the joint. This cavity opens to the exterior at the bottom of the building via a weep hole at the base of each panel joint. The pressure equalizes with the outside, which prevents water from being drawn inward, as can often result from the building’s negative pressure. The water that would otherwise infiltrate is forced outward through the weep hole, which is the second line of protection that the panels offer. Insulated metal panels are made of superior quality, hot galvanized steel and use paint systems with the latest colour technology. This is done throughout the process of pre-treatment, undercoat and topcoat with silicone-modified polyester. This system provides forty-year film integrity for most colours. Moreover, inorganic pigments give improved colour retention and resistance to fading as a result of UV exposure. The designer must choose the correct paint system according to the length of exposure to moisture, UV radiation and chemicals, as well as the environment the building is built in. The panels are composed of a foam core between the two steel sheets, making them very strong structurally. This results in needing less structural support and fewer anchors points, causing a decreased risk of infiltration. Moreover, the thicker the foam core is, the longer the panels can be without needing as much structural support, saving on the cost of materials as well as installation. A plastic film is factory applied to the exposed polyisocyanurate to eliminate the risk of water infiltration in the insulation. Furthermore, this film reduces the amount of insulating gas found in the cells, making the product environmentally friendly and non-toxic. The polyisocyanurate also has an ozone-depletion potential (ODP) of zero and a negligible global-warming potential (GWP). The steel used in the composition is made of 30% recycled steel and is 100% reusable. None of the materials contain CFCs or HCFCs and they all meet the UL and FM code requirements. Insulated metal panels are products that contribute to obtaining LEED certification for all types of products and are recognized by the Canada Green Building Council. The panels are designed to support dead loads, live loads and wind loads. The load limits applied to the panels vary proportionally based on thickness as well as fastener load capacity. Panel behaviour is similar to that of an I-beam, where the steel surface acts like the beam’s flanges and the insulation like its web. When the panel is loaded, the compressive and flexural forces are absorbed by the steel and stabilized by the polyisocyanurate so as to resist buckling. The panels can also be used for interior suspended ceilings, as they are able to withhold human weight, making them ideal for maintenance purposes. Insulated metal panels with rock wool cores have been proven to be a barrier against sound and are frequently being used in amphitheatres, schools, hospitals and other governmental institutions. The thicker the insulation is, the better the acoustic barrier will be. Foam-based insulated metal panels perform very well in fire tests and meet the UL and FM fire code requirements. But the best panels to use for fire resistance are rock wool core metal panels. They are a fire-safe solution that can offer up to three hours of fire resistance, depending on the thickness of the panels. This product is more and more in demand for governmental institutions, such as hospitals and schools, as well as in most cities, depending on the proximity of the building in relation to its neighbouring structure. The advantages mentioned above all work together to make insulated metal panels an air barrier. The materials used, as well as the panel finishes to the joint, create a seamless wall on all sides of the building. The butyl sealant and the equalizing pressure cavity help equalize both the interior pressure and the negative pressure from inside, which enables the panels to adapt to their environment as well as the forces brought upon them. Insulated metal panels are a product that will continue to rise in popularity in the construction industry as they have excellent thermal properties and multiple advantages, as listed above. Once on site, they reduce installation costs by requiring only 50% of the conventional time needed, and are environmentally safe and can be used for more creative concepts while ensuring high construction quality. As previously mentioned, panels can be installed vertically or horizontally depending on the creative direction. Each joint is factory shaped, not only giving it a certain appeal, but also making sure that the end product is seamless. Panels can also be shaped to bend around corners, giving a continuous look to the project. On site, the panels are cut to accommodate doors and windows, which are integrated using specific trims and frames. For doors, U-shaped frames are factory assembled, whereas windows use a Z-shaped trim or a 45 degree angle trim, both reinforced with an 18 gauge steel piece on top of the panel, ensuring protection for the glass, as well as the core of the panel. Subsequently, panels can also be cut in different angular shapes to match the building’s design or to accommodate the desired window shapes. Moreover, insulated metal panels come in a variety of colours, whether it be dark, light or out of the ordinary colours. Over the years, architects have loved creating a contrast with light and dark colours, as well as patterns along certain walls of the construction. Once the colours are chosen, there is the possibility of having a certain profile or geometric pattern shaped into the steel before the panel is assembled, or an embossed finish can be added. If more versatility is desired, integrated elements can be added to the metal panels to allow for even more creative expression. Films can be printed on and then installed on the panels, causing no damage to them. Aluminium accents are popular additions, whether it be sections, overlay designs or even wooden accents in order to create a meaningful concept for the building. All these applications are installed using Z-shaped brackets, ensuring the panels are not damaged during the process, but enabling architects to be as creative as they would like.